A world away from what you would see at this location today! 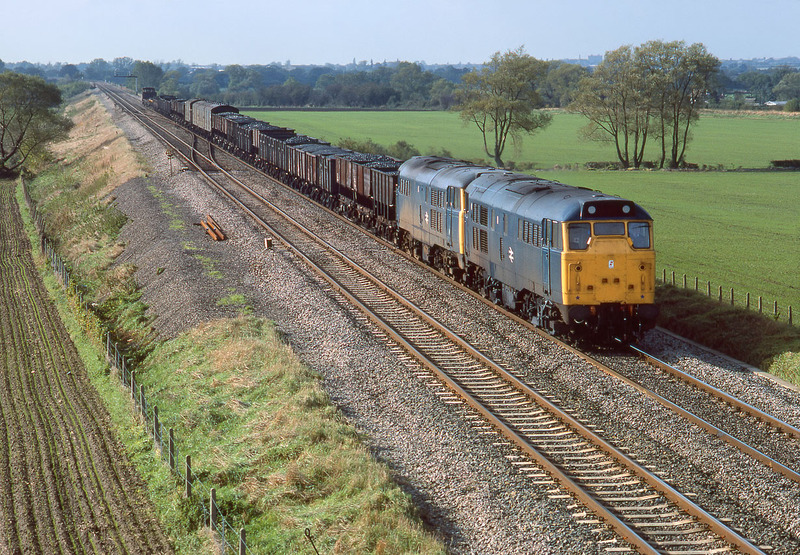 31122 & 31282 amble slowly past Bourton on 21 October 1983 with the 8A27 09:00 Severn Tunnel Junction to Acton vacuum braked freight. This was principally a service bringing domestic coal to the capital, and various grades of coal can be seen in the equally varied rake of vintage wagons. On this occasion the train is also conveying several parcels vans and a couple of engineers wagons near the rear of the train. Non air braked revenue earning freight trains were already rare by this date, and would disappear altogether a few years later. Another thing to note is that there is barely any evidence of Swindon's expansion on the horizon, in contrast to the scene just fifteen years later.